Tonight I’ve been drinking Laphroaig Tripple Wood, it’s one that I found in my cupboard when just browsing through trying to pick a dram for the evening, and it just seemed to fit the bill. I’m a real fan of Laphroaig, the 10 year old is always in my cupboard, as is the quarter cask, I lament the passing of the 15 year old, which is just like an older brother, more worldly wise, smoother, far more sophisticated, and one to look up to. I will admit that I’ve not tried the 16 year old, but I’ve got lots of others, for example the Feis Isle, Cairdeas, 19 year old (190 anniversary) as well as a trio of SMWS ones at various ages, and more than a couple of independant bottlings, but tonight it’s the turn of the Tripple Wood, and it’s lovely! I suppose I should do the whole tasting thing. Colour, pale straw / burnished copper. Taste, plenty of smoke and peat with a suble biscuit flavour, a bit like hobnobs but not so sweet. Finish, long, smooth with iodine and brine etc, you can get that kind of thing anywhere, but I’d rather say that it tastes like the place its made. As you leave Port Ellen and head towards Ardbeg, Laphroaig is the first distillery on the right, it really is that simple to find, look to the left and you’ll see your plot if you’re a friend of Laphroaig (it may be under water, mine was!) As you park and get out of the car you should (wind permitting) get the smell of the peat fire and behind it the smell of the sea, if you turn around and look upto the warehouses and the landscape beyond you’ll get the freshness of the sea andland, and really feel the ambience of the place. 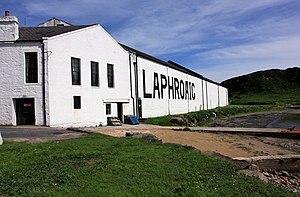 To me Laphroaig is a land whisky, yes it has the sea spray, brine and seaweed, but that is all being blown onshore and lays over the solid brown peat, the heavy vegetal smell of damp and decaying heather. Do the tour and all this is amplified, the smell of the malting floor, lovely fresh earthy aromas hit you, really malty, as you would expect. Then the smell of the kiln, the intense smoke, and damp mustiness being driven from the malt. All these are land smells, earth smells, and I think that comes through in the finished whisky, this is where the heart of Laphroaig lays for me. 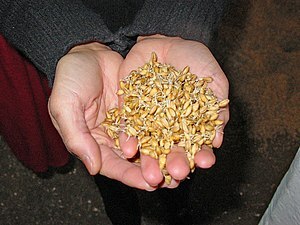 If you can, get a taste of the dried malt, only a few grains, you don’t need much! and it really tastes, and smells, like laphroaig. (we got a small bag of malt, it makes poor breakfast cereal!, but it smells great) The drama of the still house is what makes the tour for most people, but I prefer the other bits (I am a distiller, albeit Gin, so that’s the bit I know best) the casks have a real timelessness about them, the place itself has a feel of craftmanship about it that the stainless steel washbacks and still room don’t seem to enhance that much. The visitor centre and FOL rooms are all fantastic as was the tour (I’ve done 3 now!) and to finish up stood between the sea and the original warehouse photographing the big LAPHROAIG is great, and at this point you can see where the brine, seaspray, seaweed comes into play, how can a whisky stored in those conditions not pick up a lovely big fresh hit of the atlantic ocean, but it’s an add on, a bonus, a additional layer of flavour and texture to the end product. Over the long years of maturation the earthiness of Laphroaig may be toned down a bit but enough of it remains for it to be the overwhelming characteristic of the whisky, the sea can do what it likes (and it does!) but all it can do is influence the whisky, not dominate it, for dominance you need to look to Caol Ila or Talisker, both wonderful whiskiesequal to Laphroaig in their way, but both maritime whiskies! So next time you’re drinking a Laphroaig think about all that landscape, the peat marshes, the strong breeze, the thick, dark brown water, and you’ll get where all that flavour comes from. « Diabetes, But I Don’t Eat Sugar!